Ugh. I need more sleep. I've been feeling restless and tired lately. Need more sleep. Want more sleep. What can I do? Oh I know! One small, but very important, change I've implemented over the past few days is to ban my iPhone from the bedroom at night. It's since been replaced with a not-so-fancy-but- incredibly-functional alarm clock. The thing is, while I love my iPhone a lot, it wasn't helping in the "get more sleep" category. If I was having trouble sleeping, I'd turn it on and play a game or check my email, Facebook or twitter. If I woke up in the morning just a little bit before my iPhone alarm was set to go off, I'd just check my email quickly and before I knew it, I was being propelled out of bed by all the work just waiting for me. It made it impossible for me to fall back asleep, or to wake up slowly, or to even feel rested when I would wake up with a start and immediately get into go mode. 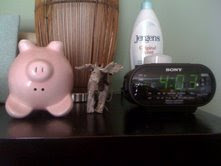 So I purchased a new alarm clock and in the past few days have already seen a tremendous difference. Before going to bed, I take my fun little iPhone out of the bedroom, turn it OFF and place it on the dining room table. When I have woken up in the morning, especially over the weekend, I've made an effort (successfully!) to fall back asleep and get more rest. Such a small change, but such a huge difference!